Put 1 tablespoon of peanut butter in the center of each tortilla and spread out. Cover with a slice of apple, some toasted almonds and 1/4 cup cereal. Roll up as tightly as possible and serve with a glass of milk. 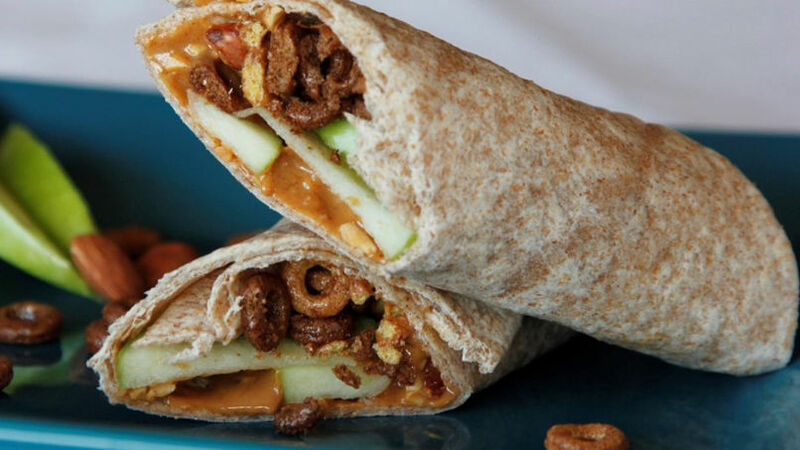 If you have salt-free peanut butter, add a pinch of salt when preparing the wraps. Green apples are ideal because they balance out the sweet and salty flavors; however, you can use other varieties such as Galas or Fuji. There’s nothing more versatile than wraps, since they can be filled with both savory and sweet fillings. I often prepare wraps when my family wants a snack, since they’re so easy to put together. My kids regularly ask for sweet treats or snacks, and this is my way of giving them something that will satisfy their sweet tooth that’s also a more wholesome option. The Chocolate Cheerios™ add a crunchy touch; they’re tasty and go perfectly with the peanut butter and apples. Enjoy!